Last year, the Pentagon made a move towards this policy change by opening up thousands more combat positions to women. And, of course, women have been risking their lives–and sometimes losing them–on the front lines for awhile now. Any tired sexist arguments about how they’re not up for the task were made moot by the fact that, like it or not, they’ve already been doing it. And now they’ll finally be get the credit–and opportunities–that come from having that service recognized. What’s feminist about women & queer folks in the Israeli army? Last summer, Israel’s bombing campaign of Gaza set records for a few reasons. It was the longest of the three campaigns since 2008. It was the bloodiest. And it saw the highest number of women serve in combat positions of any Israeli military action in history. The Israel Defense Force (IDF), Israel’s military, loves to celebrate its female soldiers. Social media savvy, the IDF Spokespersons’ office frequently posts profiles of Israeli women serving as shooting instructors, mine units, and border patrols. Last month, the IDF celebrated another new milestone for women in the military: the first female combat soldier of the Home Front Command. 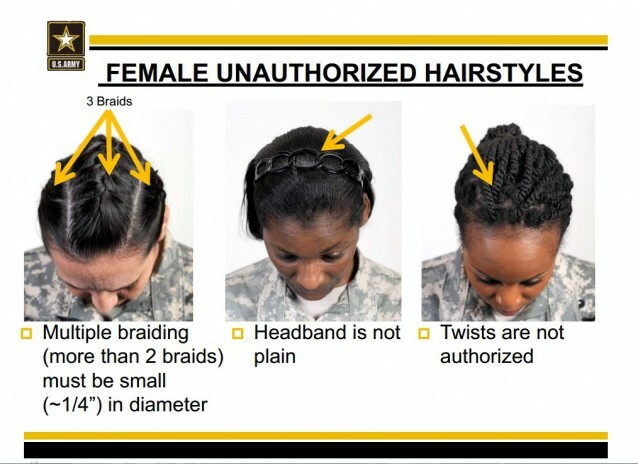 The United States Army is facing criticism after releasing new appearance standards that essentially ban most of the hairstyles that black women with natural hair wear. The regulations ban twists, locks, and braids thicker than one fourth of an inch.